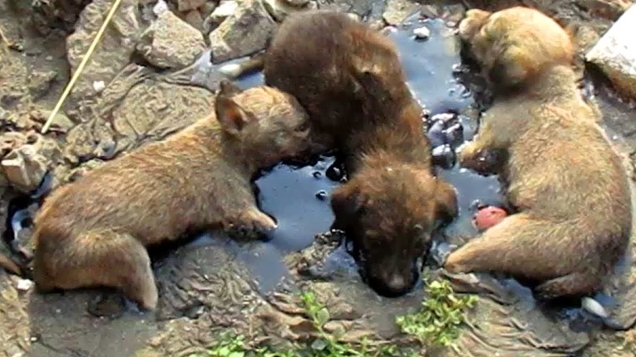 The three tiny puppies were stuck for hours in rock-solid tar and unable to move, even an inch. The stray puppies were encased in the solidified tar, which proved incredibly challenging for the rescuers of Animal Aid Unlimited. One puppy even had her mouth stuck open. Realizing they couldn’t pull the puppies out, the rescuers decided to take the entire slab of tar with them. The cries of the poor puppies pierced my heart, but thanks to the dedication of these wonderful rescuers the puppies were eventually reed from their tar prisons. “It took many hours over several days for our team to soften the tar by massaging oil and giving many baths, but these three puppies had incredibly strong spirits,” Animal Aid Unlimited writes. Animal Aid is a vital rescue center, hospital and sanctuary for injured and ill street animals in Udaipur, Rajasthan, India. They rescue thousands of hurt and sick animals each year and provide sanctuary to those who need life-long care. The Animal Aid Sanctuary is home to animals permanently disabled from accidents, fragile, blind, and those in need of long-term medical care. They have given permanent sanctuary to over 150 disabled and special needs dogs, 40 cows and bulls who were left to die on the street by dairy farmers, and over 30 handicapped donkeys rescued from abusive owners. Responses to "Three Puppies Trapped In Pool Of Tar And Unable To Move Rescued "
You are heroes you guys, thank you so much, God bless you. This is the most touching story of caring people who never gave up — this rescue took days, abd and still the team persevered. There will never be enough thanks! !